NEW! Front-end post submission form with validation and email notice. * Fixed: "Submit news" form error when no image is provided. * Added: Option to control if post preview links to page. * Updated: improved legibility of site content and styling. * Improved: replaced deprecated functions. * Improved: zero theme check errors. 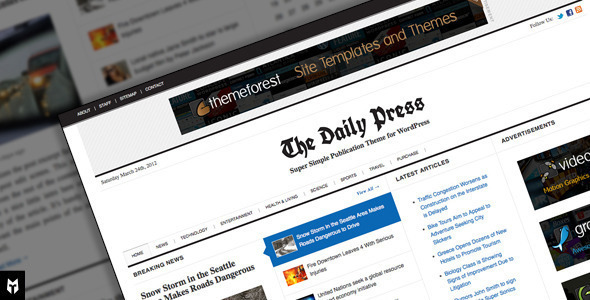 * Added support for new WordPress 4.2 sidebar requirements. * Updated theme customizer to comply with new code standards. * Fixes Related posts issue. * Minor bug fixes and layout improvements. * Added image upload option to news submission form. * Minor bug fix for webkit browsers. * Fixed: minor markup errors. * Improved: Secondary sidebar turns into footer widgets on narrow displays. * Fixed: 3rd level drop down menu. * Added: theme localization with .POT file included. * Added: built-in OptionTree system. Plugin install no longer required..
* Fixed: media file searching in dashboard. * Fixed: Google custom fonts issue.